On August 28, 2011, Hurricane Irene slammed into Sutton and took down numerous trees and power lines. On August 31st, three days later, my friend Paul offered to take me on a boat ride around Ramshorn Pond to take a look at the situation. The weather was absolutely beautiful, and while we saw a few trees down, it was a marvelous testament to how mother nature continues on! The clouds were lovely out. 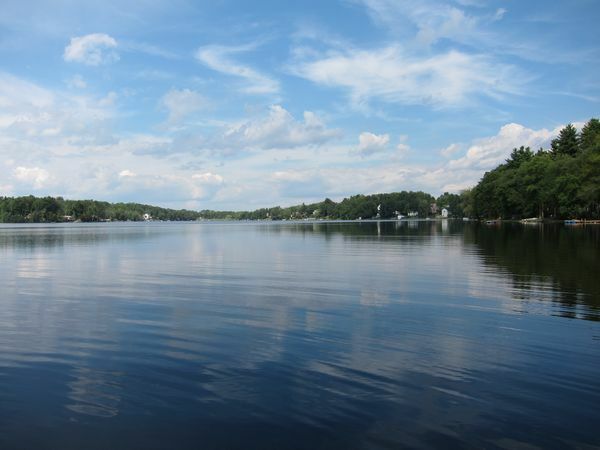 The pictures on the topic of Ramshorn Pond Sutton MA for this slideshow were all taken by Lisa Shea. Celebrate your enjoyment of Ramshorn Pond with these gorgeous tshirts, mugs, tote bags, and other items all emblazoned with the serene blue waters and painting-like beauty of this lovely area.